It was after midnight when I realized my daysail with Tony Bullimore aboard his giant record-breaking catamaran, Team Legato, was not going to plan. The big cat was en route for a December dash from England across the Bay of Biscay to Barcelona and the start of a drag race around the world for the fastest boats on the planet. It was called simply The Race 2001—a nonstop, no-limits marathon with a $2 million prize for the winner. All eyes were on Bullimore to fly the flag for Britain after Pete Goss’s revolutionary wave-piercing catamaran, Team Philips, with its unstayed, windsurfer-style double rig, had been abandoned a few days earlier in a violent North Atlantic storm. 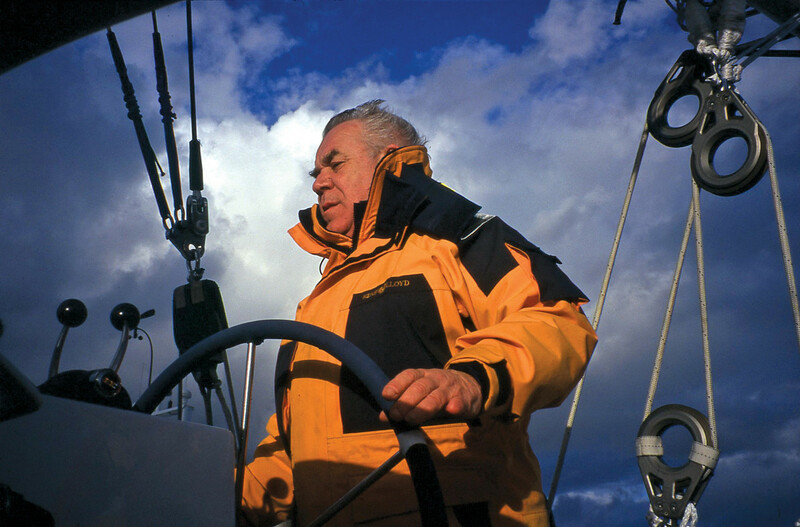 At the time I was deputy editor for a British yachting magazine and with three other journalists, I’d been waiting on standby for a weather window to sail with Tony from Bristol, England, on his shakedown cruise. 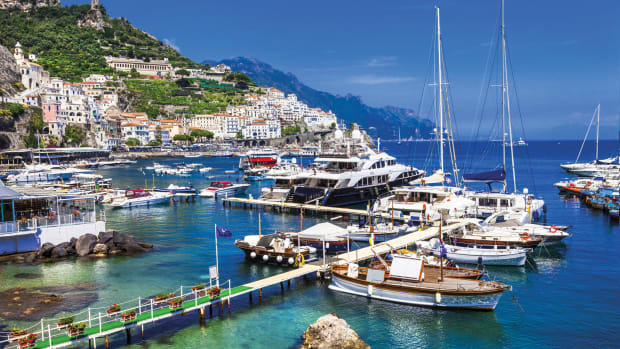 The plan was to drop the sailing scribes off next day in Falmouth, Cornwall, notebooks bulging with salty tales of life aboard a maxi-multihull, while Tony and crew would crack sheets for Barcelona and the midnight millennium start on December 31, 2000. On December 18 the window opened and as Bristol slept we motored out of the docks under a full moon. 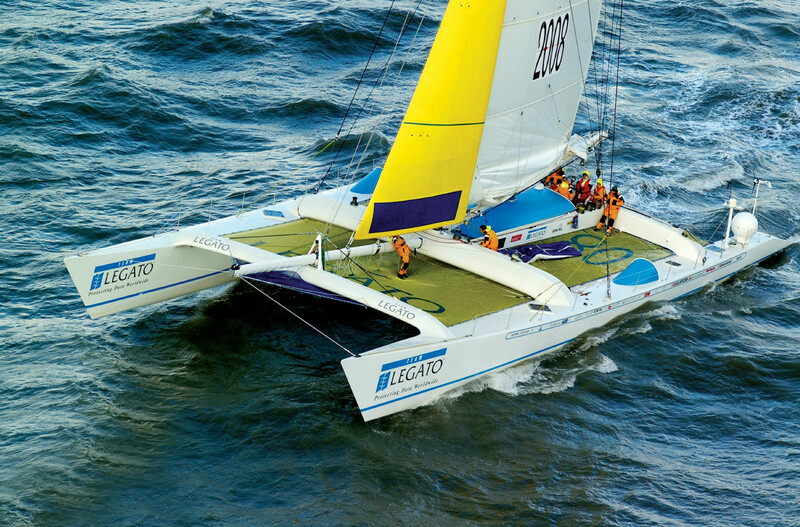 Team Legato began life as Formule Tag, designed by British multihull supremo Nigel Irens for Canadian skipper Mike Birch. 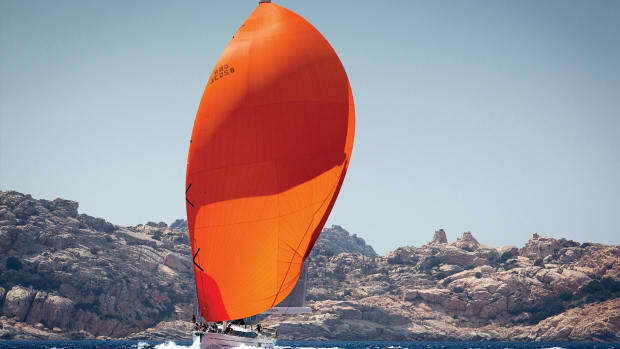 She was one of the first Kevlar and carbon fiber multihulls and Birch set a new record with her, 516 miles in 24 hours. Later, she was christened ENZA to set a new Jules Verne Trophy nonstop round-the-world record in the hands of Peter Blake and Robin Knox-Johnston. 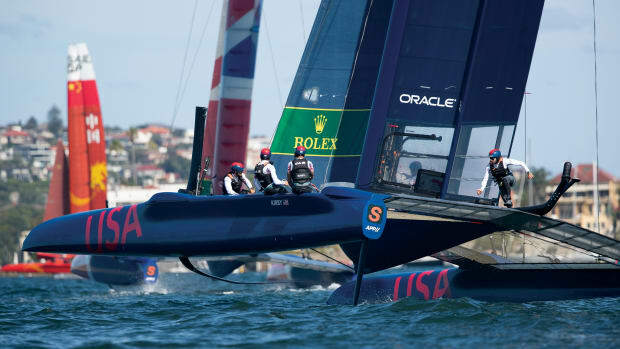 No multihull afloat at the time had held more records. As we climbed aboard, Tony declared: “She’s been turned back into a formidable weapon.” And in fact, he had re-mortgaged his house and spent more than one million pounds, stretching the cat go from 92ft to 102ft and fitting a new 109ft carbon-fiber wing mast. He’d also had just two hours sleep that night and not a lot more in the preceding few months as he raced against the clock to complete the refit. Her new suit of sails hadn’t yet been used and her crew, from Britain, France, America and the Ukraine, had yet to sail her. At 5ft 4in, “Captain Bulldog,” as Tony Bullimore’s wife, Lal, fondly called him, was a small, chunky man with a big heart and the tenacity of a pack of bulldogs. He was also famous as the hero of one of the great sea survival stories of modern times, when three years earlier, during the 1997 Vendée Globe, he had been trapped for five days in a tiny air pocket after his yacht, Exide Challenger, capsized and became a freezing wet tomb deep in the wastes of the Southern Ocean. He was eventually rescued by the Australian navy. The only sign of his ordeal was at the tip of his little finger, where the first joint had been lopped off when a hatch slammed shut as his yacht turned turtle. As for Team Legato, she was capable of a then incredible 500-plus miles a day, and pounding to windward against the Bristol Channel tide, with two reefs in the main, we were soon making around 9 knots. For a brief time, we clocked 23 knots for the benefit of our photographer, taking publicity shots from a helicopter. As we were doing so, Barry Pickthall, a British photojournalist and Bullimore’s press spokesman, was standing beside me in a bright orange one-piece survival suit. “Thirty-five quid ex-North Sea oil rig rescue gear!” he enthused. His dress sense seemed a bit over the top for a daysail, but Barry had organised the trip, and I wondered if he knew something I didn’t. By lunchtime, our “shakedown” cruise was turning into a shake, rattle and roll passage. Making a cup of coffee in the port hull was like being stuffed in a subway train carriage and fired down a water chute. By mid-afternoon, there was talk in the cockpit of a deep depression charging across the Atlantic. Navigator Jason Owen wanted to get some westing and joked about dropping us off in Ireland. Supper that evening was a packet of chips, a Mr. Kipling cake and half a crust of bread, found in the back of the galley. I applied a liberal helping of peanut butter. It was an improvement on the two cookies we had for lunch. With 10 crew aboard, plus four journalists and only eight bunks, you didn’t need to be Einstein to realize that by 2200 it was time to grab a berth as we headed for Land’s End. For a boat as big as a tennis court, crew accommodation on Team Legato was a Spartan Special. We scribes were allocated the three pipe berths in the aft section of each hull. “Overcrowding that would lead to a riot in any prison,” was the verdict of former co-skipper Robin Knox-Johnston from her ENZA days. That, no doubt, was why Tony was smiling as he retired to his five-star bunk in the God Pod, a windowless carbon fiber igloo suspended between the cat’s fore and aft beams. It was a three-star annex created by Knox-Johnston and Blake that doubled as mission control with all the electronics. To access the amas/outriggers, we dropped down through a circular deck hatch, not unlike a submarine. The words “Dive! Dive! Dive!” were appropriate as Team Legato powered into the front of a wave and a wall of whitewater swept the decks. It was a case of the quick and the dry, or the slow and the very, very wet. I felt like a primeval cave dweller as I crawled into my bunk. The only way to stay dry was to stay dressed—in my foulweather gear. It was like sleeping in a drainpipe. The noise and vibration of 12.5 tons of boat slamming to windward made sleep impossible; leaks from the diesel engines in both hulls turned the floors into skidpans. In fact, Bullimore’s #2, Frenchman Bernard “Zoe” Perrin, had decided it was “too dangereux’” to transfer us to a RIB off Falmouth. Instead, the boat was racing southwest to escape the storm. Next stop—Spain. Scott’s protests that he had a pressing engagement with his girlfriend in Bristol fell on deaf ears. Our lack of passports didn’t cut any ice either. A quick glance at the chartplotter in the God Pod revealed we were clocking between 17 and 23 knots toward a desolate point on the chart marked “Porcupine Abyssal Plain.” England was already far astern. Oblivious to the drama, Bullimore gently snored in his bunk a few feet away, dreaming, perhaps, of tradewinds and flying fish. Somewhere in Falmouth, a French photographer was going to be very disappointed. He was waiting to be picked up by the RIB that was supposed to drop us off, so he could sail with the boat to Barcelona. As for me, I had an appointment that afternoon at my magazine’s Christmas party. It was, therefore, time to use the yacht’s state-of-the-art comms and let the world know what was happening to us—except we’d left Bristol in such a hurry that nothing had been set up yet, with the satcoms, SSB and VHF radios all still in their boxes. The wiring had also not been completed and the manuals all left in Bristol in the rush. In other words, there was absolutely no way for us to get the story out to our newsdesks about being shanghaied (cat-napped?) on the high seas. Bullimore, now awake, apologized and repeated his concerns about approaching Falmouth, a lee shore, in a Force 7 with a dodgy starboard engine, as well as an untried boat. There was nothing for it then but take it on the chin, sit back and enjoy the ride—and what a ride it was! I spent three nights “hot-bunking” in the God Pod with Tony and Jason as we pounded to windward in Force 7-8 conditions. Waves smashed into the floor like sledgehammer blows. 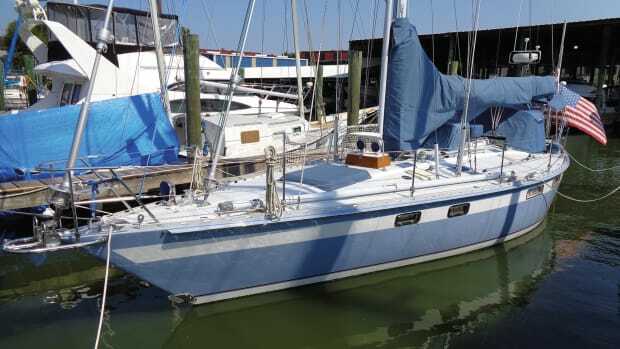 Even Tony said, “It needs to be fitted with shock absorbers!” During the ENZA voyage, Peter Blake had been so badly bruised in one wave strike that he took to his bunk for a week with painkillers and a neck brace. The welcoming glow inside the God Pod from radar, chartplotters and laptop screens was almost as welcome as a log fire after the Spartan misery of the hulls. Swept by big waves, the noise inside sounded like a ton of gravel being dumped on us. At night, a canvas flap shielded the helmsman’s night vision from instrument lights.  As we hurtled into the blackness, Bullimore waxed lyrical about multihull sailing. Racing at 28 knots on water like glass (unlike tonight) was “like being a bullet going down the barrel of a gun,” he enthused. On this night, though, with gusts of 45 knots, it was like hurtling down a motorway at top speed with no headlights, no windscreen, a jammed throttle and a lot of potholes. One moment we were airborne. The next we were crash-landing in a trough. By dawn on Day 2, we had covered 630 miles and were about 100 miles off Finisterre. At this rate, we reasoned, we could be dropped off in Vigo or Bayonna in a few hours. Barry had an important photo assignment in London that weekend. Unfortunately: “Vigo too dangereux... a Force 9 and lee shore...” Zoe muttered as he altered course and tacked away from land. Afterward, Barry and I convened a meeting of the “Escape Committee” in the God Pod. It seemed the “Vichy French,” as we dubbed them, might hijack us all the way to Gibraltar. However, we were powerless to do anything about it. At least I was able to enjoy the thrill of helming Team Legato, the first boat I had sailed that was capable of reaching 35 knots and flying a hull. Ironically, despite the conditions, hydraulic steering made the load on the helm quite minimal. Mike Gettinger, one of the American crew, showed me the trick of bearing away just enough to build up speed and coming back up to course all the while maintaining speed. She was a rocketship. Heading into a line squall on Day 3 I took my turn on the mainsheet. “It’s your finger on the trigger!” Mike said, a glint in his eye. A strong gust had the potential to capsize the works. The mainsheet on this beast carried a load in excess of 10 tons. By Day 4, we felt part of the crew, sharing watches and galley duties. Scott and I cooked spaghetti with curry sauce, wearing full foulies to avoid being scalded. Dressing for dinner took on a new meaning. It was a 20ft sprint from the God Pod across the trampoline to the galley, running a gauntlet of waves. You needed to make sure all wrist, neck and ankle seals were watertight. A rogue wave could knock you off your feet. After almost four days of headwinds, two gales and with food running out, Lisbon, 100 miles away, became our destination, and by dusk we were close enough to the coast to get a cell signal. Finally, families and colleagues knew where we were and what had happened. Postscript: Next day we scribes headed to the British Consul’s office in Lisbon to get emergency passports. We all flew back to London with Tony, who generously paid our airfares. New Zealander Grant Dalton won The Race on Club Med in 62 days 6hrs 56m. American Cam Lewis skippered Team Adventure home to third place in 82 days 20hrs 21m. Tony and Team Legato finished fifth and last in 104 days 20hrs 52m. The only other American entry, Steve Fossett and Playstation, was forced to retire with gear failure. This record-breaking maxi-cat has had a long and storied career. Designed by Briton Nigel Irens and built by Canadair in 1983, she was christened Formule Tag and was one of the first boats to use carbon fiber aircraft technology. 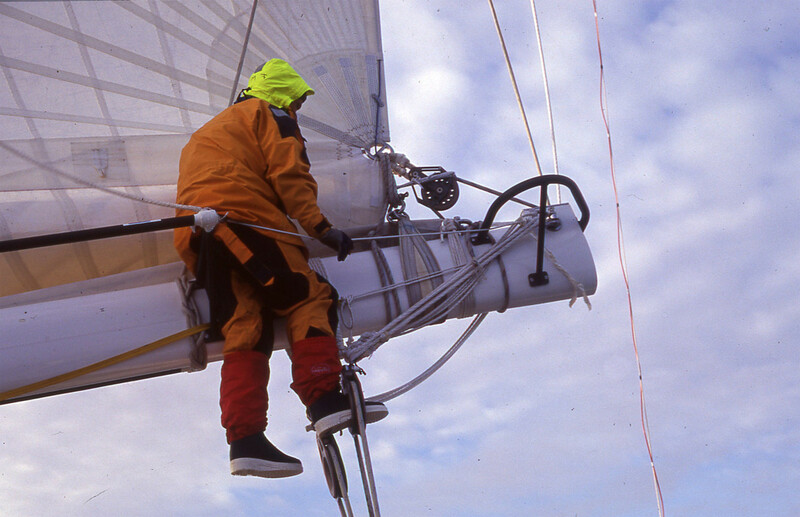 She sparked the whole maxi multihull record-breaking circus: under skipper Mike Birch, the 80ft maxi-cat held the 24-hour record of 522 miles for many years. 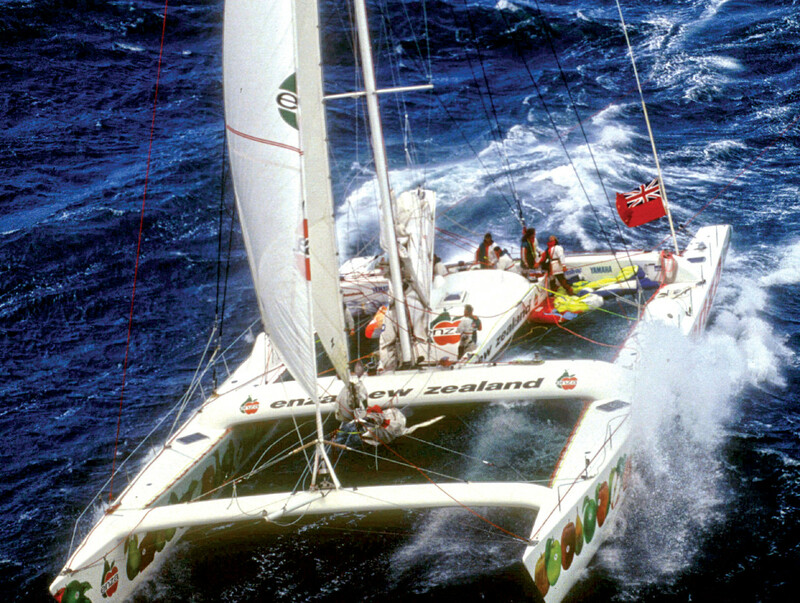 ENZA New Zealand: For their first bid in 1993 to win the Jules Verne non-stop round the world race, co-skippers Peter Blake and Robin Knox-Johnston dispensed with Formule Tag’s exposed steering cockpits on each hull and installed a central module nicknamed the God Pod. 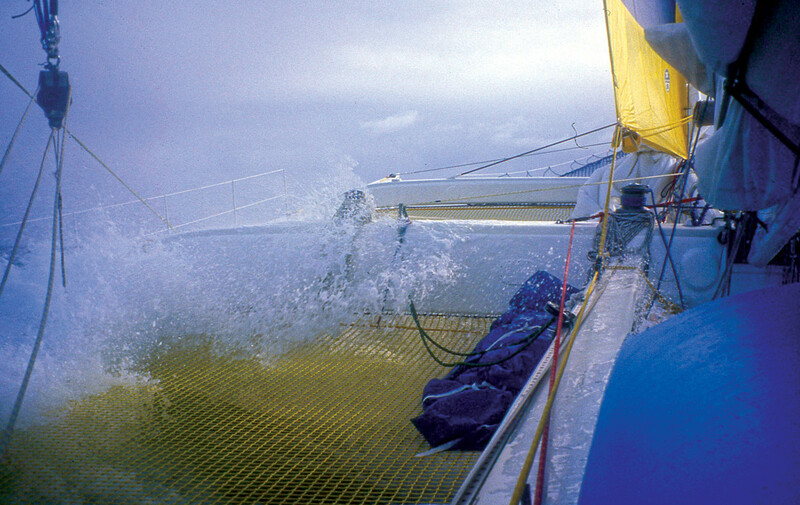 Holed in the South Atlantic on the first try, Enza was stretched to 92ft for a second attempt and in 1994 won the trophy in a time of 74 days and 22 hours. 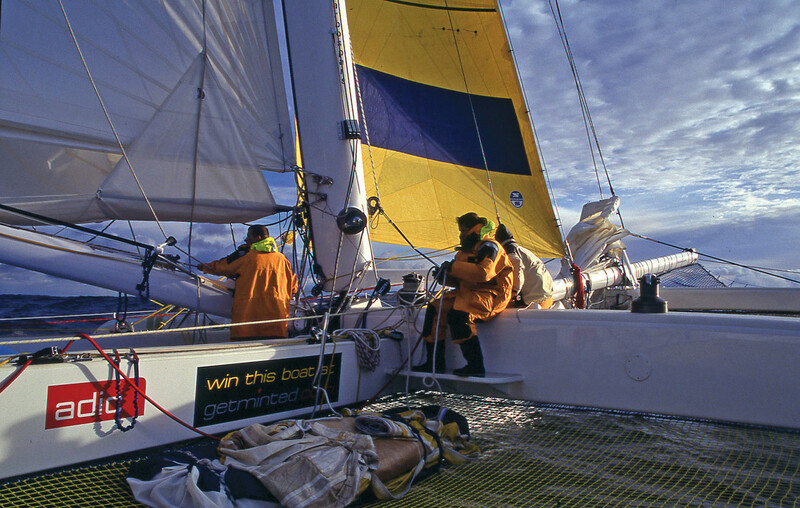 Royal & Sun Alliance: In 1998, former Whitbread racer Tracy Edwards skippered the fastest all-female crew to sail the Atlantic in 9 days 11 hours. 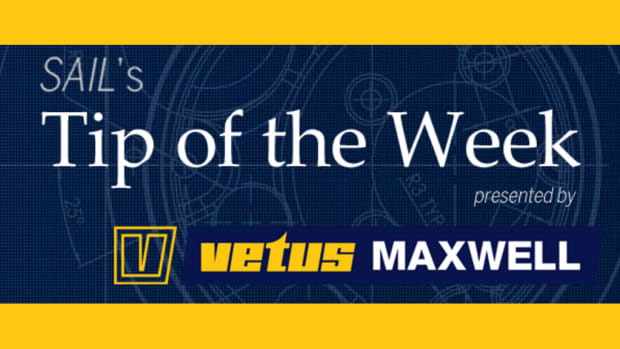 Their bid for the Jules Verne Trophy ended when the cat was dismasted in the Southern Ocean. 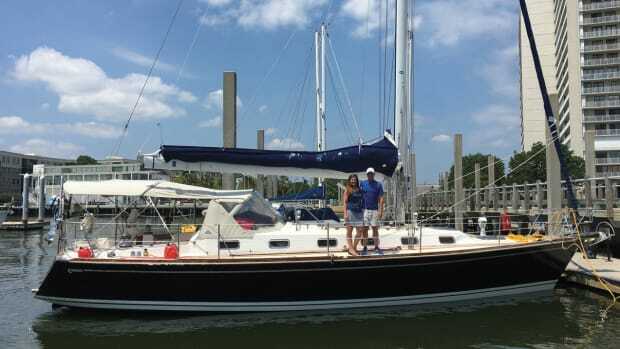 Team Legato: Tony Bullimore bought her in 1999 and stretched her to 102ft for The Race in 2000. She was renamed by Tracy Edwards for the 2005 Oryx Quest race. Doha: After an extensive refit in Qatar in 2006, she was renamed Doha as Tony Bullimore continued his quest to break the 70-day solo non-stop around the world record. 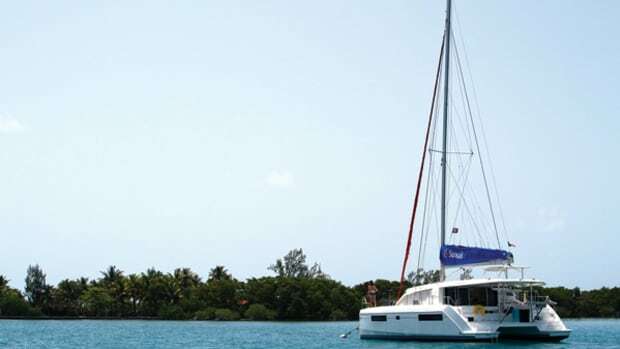 Spirit of Antigua: Still owned by Bullimore and renamed for the seventh time, she capsized in 2010 on a delivery trip across Biscay. Energy Observer: After lying forlorn in Brest, she was re-launched in April 2017 as the world’s first boat hydrogen-powered vessel, aiming for energy autonomy with solar power and zero greenhouse gas emissions.